The 2011 Dyneema Experience Team is underway testing the strength and function of Dyneema and sharing the Experience with the world. APS has been happy to get involved with the project. Here, we highlight Skipper Pete Hunter who has paired with FSE Robline to rework the running rigging on his Thompson 30 Wairere. These backstays have been made from 12-strand single braid Ocean 3000 by FSE Robline, which is entirely Dyneema SK-75, abrasion and UV resistant. The upper and lower backstay legs have been assembled complete (read: a 12-strand eye splice secures Karver blocks and 2 lashings keep them in place). They are lashed to stay in place as a result of the diameter of the line, which runs thick (a.k.a. fat) in this application. A Ronstan Sailmaker’s Thimble has been spliced in place to attach the backstays to the mast. Silver 10mm Admiral Dyneema jib sheet (at left) has been made from Dyneema SK-75 core for a high breaking strength and a 32-plait polyester cover to minimize abrasion. 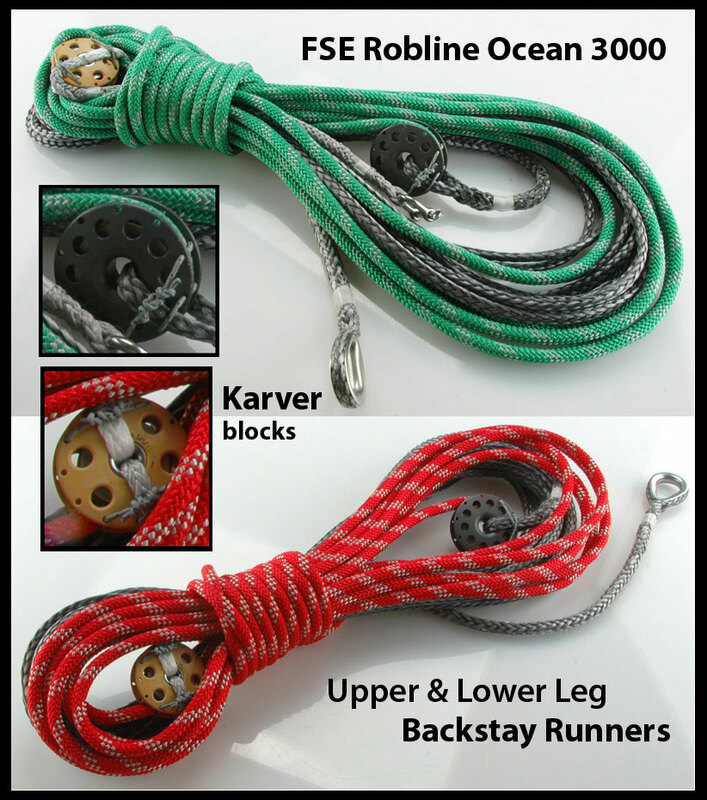 The sheet has been finished with an end whip on on the tail and a high tech double braid eye splice on the other – to which a modified FSE Robline soft shackle has attached. APS riggers added a pull tab (see small red line) to the soft shackle to improve efficiency and ease of use. 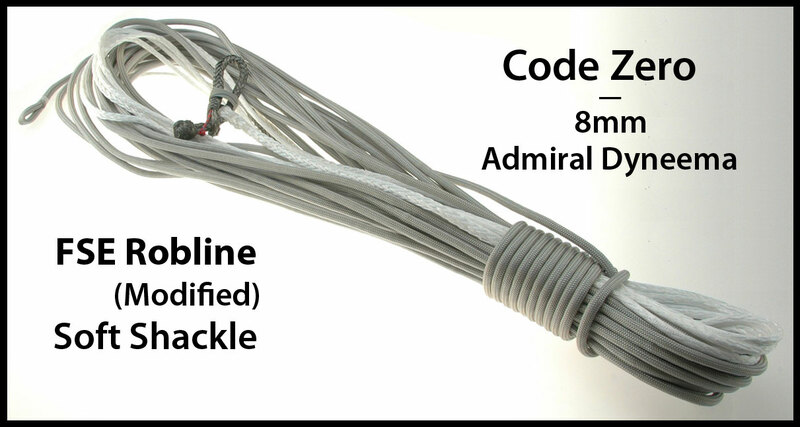 *Note: APS Dyneema Shackle Loops (DSLs) would be an ideal option for this application. The inhaulers on the right have been made from FSE Robline 6mm Purple Dinghy Control Line. The core is exposed at the luggage tag splice, and the cover has been whipped in place on both ends. Below, you see the new spinnaker halyard. 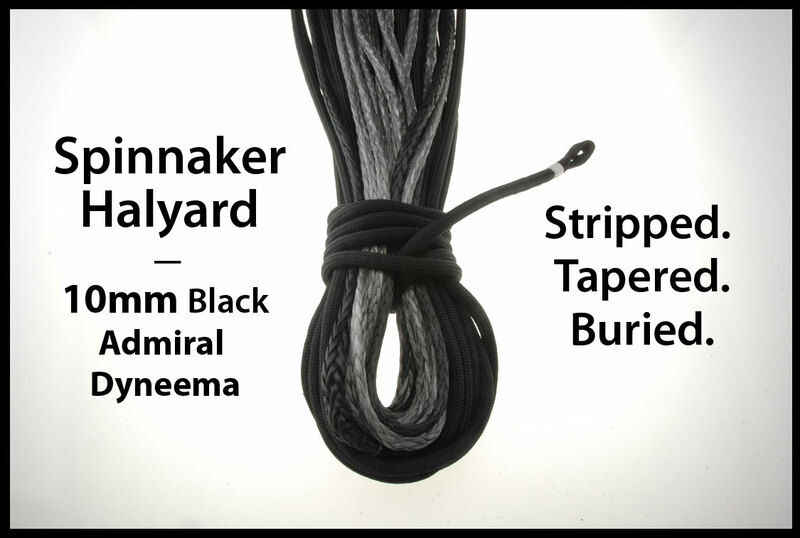 It has been made from 10mm Black Admiral Dyneema, which is the same line used in the jib sheets. The halyard has been stripped, buried, and tapered; finished with a Reeving Splice and a Halyard Ball Stop. Below is a tackline that has been made from 3/8″ blue/silver FSE Robline Globe 5000. Prized for low stretch and strength, Globe 5000 has two covers to protect the Dyneema core. A 32-plait cover rests over an intermediate polyester cover with more structured fibers to protect (and integrally bulk) a Dyneema SK-75’impregnated core.’ The core was disturbed when APS riggers strip tapered the line so blue Yale Maxijacket was carefully applied to reconstitute the line’s UV integrity. 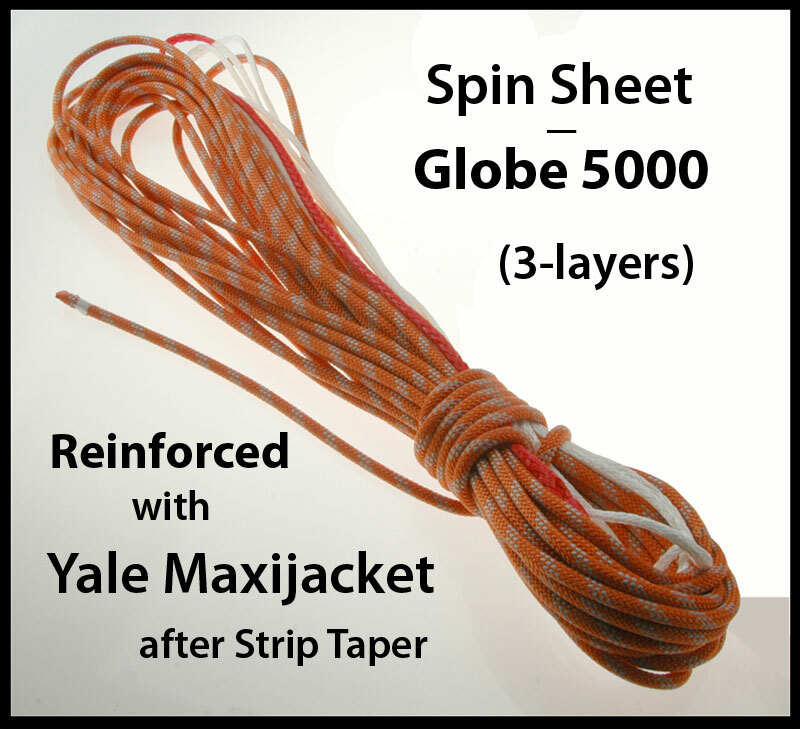 (More info about Yale Maxijacket can be found below in the spinnaker sheet description.) APS riggers always reinforce disturbed lines with Maxijacket to ensure rigging clients get the longest life out of their lines as possible. This line has been finished with a luggage tag splice and an end whip. Like the tackline, the spinnaker sheets were made from FSE Robline Globe 5000. Also, the sheets were reinforced with Yale Maxijacket where the cover was progressively stripped, tapered, and buried. Maxijacket coating is great stuff. Its primary function is UV protection. Maxijacket also firms lines/makes them stiffer; makes line more snag/abrasion-resistant; keeps grit, dust, and dirt from working into the line; and increases the life of line. The Globe 5000 core is already ‘impregnated’ with a coating that serves to protect the line; however, when the core has been manipulated and the braid has been worked apart to make way for splicing, tapering, or burying, it’s a good idea to apply Maxijacket to reshield the line. Here you can find a short review of the Dyneema Experience (and the APS rigging experience) from one of Wairere’s crew. The Dyneema Experience is running contests every week to give away free Dyneema goodies. If you want in on the random drawings, all you have to do is join the crew of one of the 40 team skippers. If you click here, you’ll see the sign-up box to the right of Pete’s profile. APS is wishing you all the best, Dyneema Experience Skippers!